I was born in a small town not far from the New Forest. Now and again in the evenings, as a family, we would go and watch the deer from a viewing platform. It was like theatre, and we were in the dress circle, looking with binoculars at a sun-dappled herd lazing under a canopy of oak trees, or an antlered monarch stood on ceremony. There was also the Rufus Stone – a memorial to King William II, slain in 1100 while hunting. 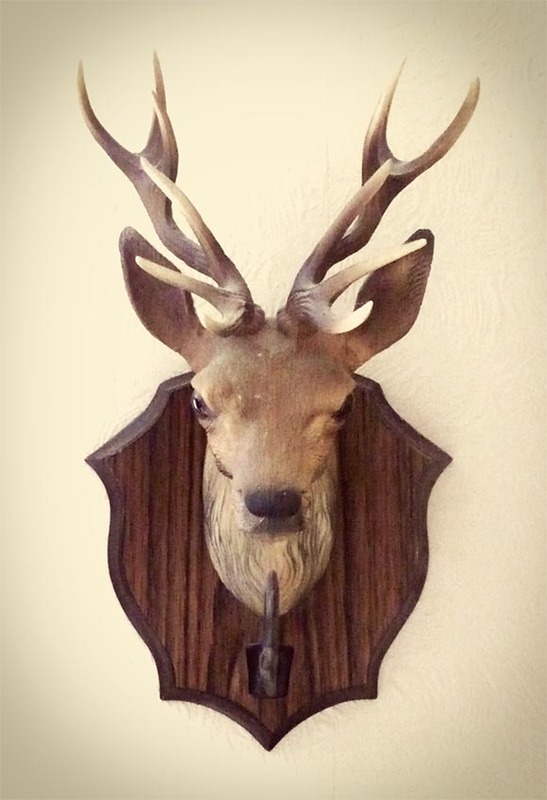 A deer’s head made from plastic, circa 1970, made in France (oddly). There are four cow bells which go with it and a plastic beater for chiming. This was in our 1970s house until a bad taste purge sometime in 1981 in which it was replaced. I’ve since rescued it: for one thing, nothing died to make it, and he has a certain presence (as long as the bells stay in the attic). I loved stories of Robin Hood, dreamed of living and waking among trees, and later devoured the wild landscapes covered in Roger Lancelyn Green’s stories of King Arthur. 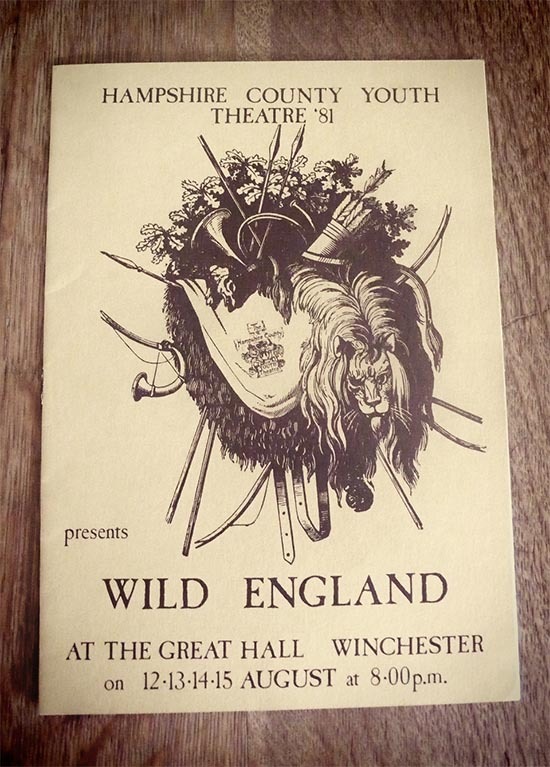 Winchester, home of Edward I’s recreated round table, seemed magical, and one summer I watched my brother’s girlfriend in a play at the Great Hall. It was inspired by Richard Jefferies’ book After London: Wild England, in which the country is ‘returned to nature’ by a great flood. In the final scene she took a white mouse from a small box, which ran over her hands as she spoke… the last living creature? On reading After London: Wild England, William Morris made these dark comments: “I have no more faith than a grain of mustard seed in the future history of civilisations: which I know now is doomed to destruction, probably before very long – what a joy it is to think of! And how it consoles me to think of barbarism once more flooding the world and real feelings and passions taking the place of our wretched hypocrises”. In 1980, en route from the New Forest to Devon, through Tolpuddle and Dorchester, you could still imagine Thomas Hardy’s heart fluttering past the cottages, the window-frames layered with paint from his lifetime. Whatever our experience of nature and landscape, it becomes part of us. It’s not something we might acknowledge until there are some years behind us. The realisation comes through a growing susceptibility to pain at seeing it fade and become unfamiliar. And it’s different for each generation; what is still beautiful to a 20-year-old today might be wrecked in the eyes of someone who knew it decades ago. Some passing things might be rescued in the only way our age seems capable of doing – over-analysing, creating niches to attract like minds and consolidate exactly what it is we want to perpetuate: unaltered landscapes, timeworn buildings, to preserve an ancient thread over centuries and keep in check our ability to modify and obliterate within a few minutes. 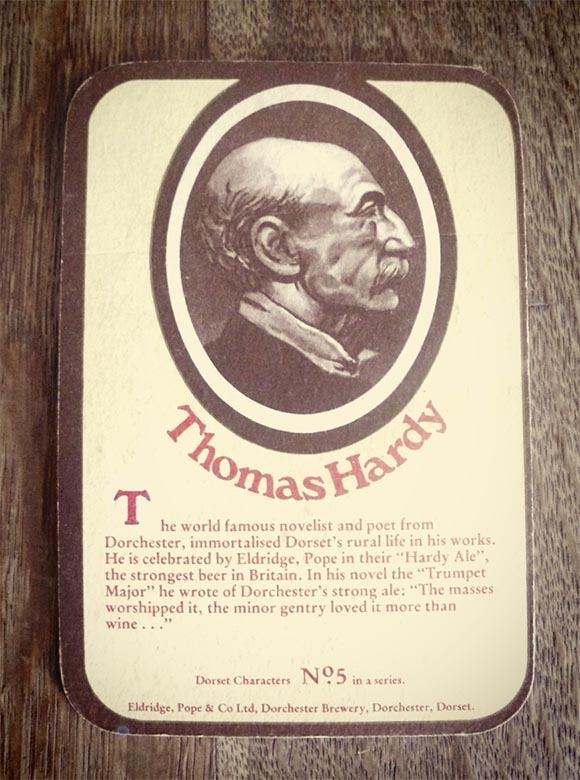 A beer mat from 1980. But we cannot picture ‘the countryside’ as existing outside the trends of our century. I’m typing this in a cottage with walls eighteen inches thick. You would barely hear a dog bark from next door, and yet I can hear incessant bombing from an Xbox, and when they’re not obliterating war-torn cities, it’s Formula 1 racing. There will be a huge hyper-real screen, the key point of interaction for the now and future, unless you disconnect, edit your life and put a shepherd in your garden like Marie Antoinette. I can, however, walk out on the moor and see the sheep, see the ponies, think of how many were recorded as neglected and emaciated earlier this year. It’s not so unlike urban life. Since the Industrial Revolution our national consciousness has bred art and writing attempting to capture the essence of the countryside. Generally we’re told that this vision exists only in our imagination. It’s not long since there was derision in many quarters that the Olympics ceremony should draw on our ‘green and pleasant land’: how old-fashioned, how twee, how backward. But perceptions are remoulded as the years pass. Over the last decade a particular appreciation of the natural world has grown up: the fashionable face of nature-loving. Cooler record stores stock books from Caught by the River, music festivals are entwined with food and literary festivals… it is traditional non-corporate life as we might imagine it, restyled in a way palatable to lifestyle media. Fashion became obsessed with images of a stark, skeletal nature – animal heads, something dark in the forest. Chuck out your Beatrix Potter, to paraphrase Ikea. Whether this rings true depends on your circumstance, but it captures a moment, a place where the new godhead is Robert Macfarlane, who took the authenticity of Richard Jefferies, Edward Thomas et al and washed away sentiment. 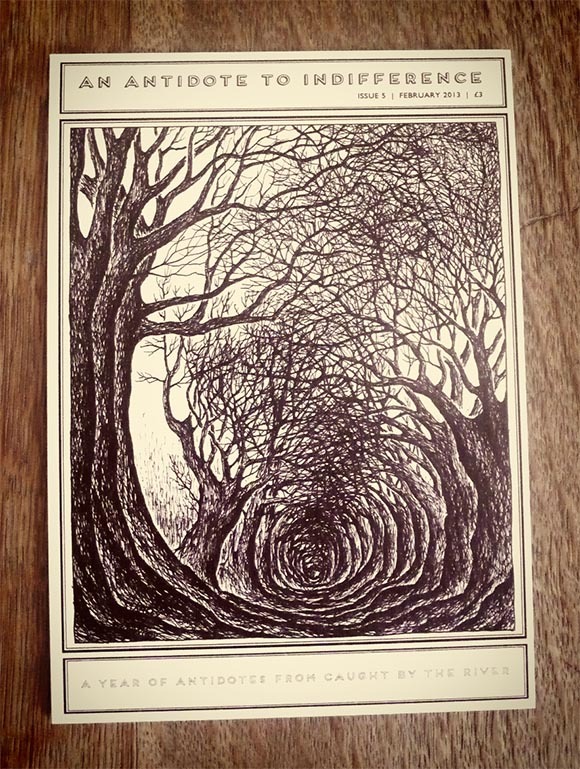 One of Stanley Donwood’s beautiful ‘holloway’ illustrations which appear in Robert Macfarlane’s latest book. This is all far from a knitted, unfashionable image of walking holidays in the countryside. But at the turn of this century, the nearest the lifestyle media might come to indulging such pursuits was a photo of Alison Steadman as Candice-Marie in Mike Leigh’s Nuts in May. Of course, that quiet, ancient thread was always there and had never faded: the small publisher reissuing work by BB; people like Jack Hargreaves (as a child, he was a regular at 7pm most evenings on Southern TV – an elderly chap in a garden shed intoning about country pursuits with all the manner of a leisurely mull over beer in his village pub); the bench thoughtfully positioned in the unfashionably-termed ‘beauty spots’ on some unsung track – Frank loved this view and this seat was put here by his wife; the plethora of ornaments featuring wild animals in immaculately-crafted detail, endless prints of badgers, foxes or kingfishers in faux-gilt frames; Watership Down; Alan Titchmarsh enthusing about something or other… the solid dark green livery of the National Trust, set in stone and as yet uninterpreted; unflattering waterproofs before a testosterone-fuelled industry kicked in, now entreating us to ‘take all nature can throw at you and throw it back’. Our new century is growing up but are we still living by illusions? Is our search for wild nature, the individual and the independent any different to the 1930s retreat to Olde England in the face of modernity? We like to think so. Perhaps we’re just the same as any age, hankering after Utopia, but won’t admit it. Let’s be cynical for a while. You can no longer drive through England and pass rows of cottages that would be familiar to their generations of owners, sun-faded with wrinkled render, mossy roofs and watery window panes. Well, you can, now and again, but it will be so beautifully preserved and Farrow-and-Ball’d that it’s a stage set without a cast. Yet the metal-embossed road sign at the cross-roads is at ease and true, a little rusted. Stand in the village square and choose your century. Not so long ago, it seemed we would always be able to come here and reconnect. Tempted by practical comforts, low maintenance and rewards for environmental friendliness (or beaten by blanket-bombing marketing) the buildings in our villages and towns have been given make-overs with flawless float-glass double-glazing, immaculate shadowless render and plastic doors holding just an echo of beaded moulding to remind us what a timber door looked like. Shop signs are sheets of plastic screwed to the wall with the freedom of any font, any colour and any clipart the software allows. The signpost at the crossroads has Jock Kinneir and Margaret Calvert’s carefully-constructed Transport font condensed and squashed to fit the space on the standardised reflective board. This is life lived with care for immediate practical needs, even survival. These villages will not age gently and fade into the landscape anymore, or admit eccentricities, but they are no less authentic than the badger in his sett. It’s OK, they’re part of a stuffed display, but this is confusing for dogs. Preserved cottages are more often empty, the 19th century hovel a 21st century luxury from coffee table books. In off-track villages they’re part of the idyll, reassuring visitors that somewhere things are running in computer safe-mode, waiting for a some-day-soon. They are stage sets, and outside showtime life is still reduced to the comforting essentials: no shop, no pub, no jobs, refuelling with coal or damp wood on the hour to keep a radiator working, no salt or grit for frozen roads, no privacy. Decimated, the last of generations remain knowing they cannot make a living from the land like their fathers and mothers and yet struggle on. It’s in their skin and has been there since birth, every nuance of weather, every flutter of wing. Those dependent on the countryside know it as the rabbit knows the fox or the sparrow knows the hawk. This is becoming nature, where survival is king. Are the rest of us able to say we really know the countryside? Or are we indulging the luxury of being able to consider a longing for nature’s otherness, a reminder that we are part of something truly beyond humankind’s control, the pull of the primeval? We might infuse our responses with modernity, a scrabble for authenticity: ultimately, it’s a privilege to be able to do so. We are looking to ideals, a pursuit of beauty, the antidote to over-sophistication, a dream of Utopia, a return to Eden. No matter whether we express this with a well-placed bench, a faded print or bestselling literature, it’s an illusion that belongs to us all.